This is not an airy-fairy tales of princesses and peas – or dungeons and dragons. This is no cute little bed-time fantasy to escape from the drudge of a hard life. This is the reality of God’s plans and purposes for each blood-bought child of His. Heaven and its wonders will still be rich and glorious in the future ages to come. 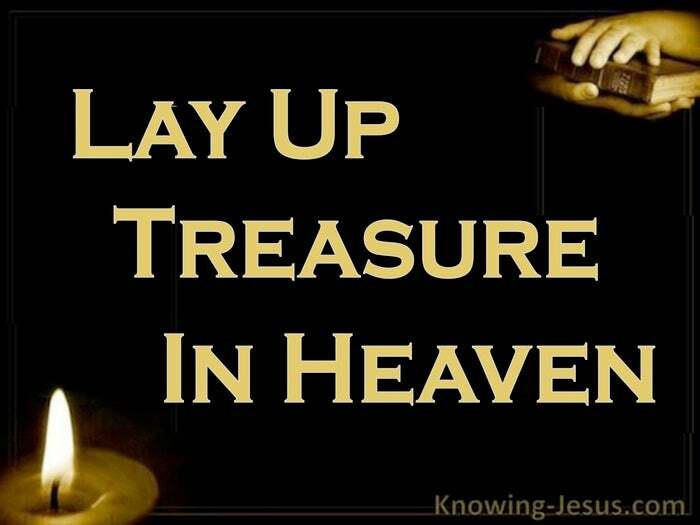 Heaven will still be a fact when this world has slipped into a distant bygone age, And we are charged to store up treasure in the world to come – our heavenly home, and if we comply with this directive, we will be blessed both here and there. 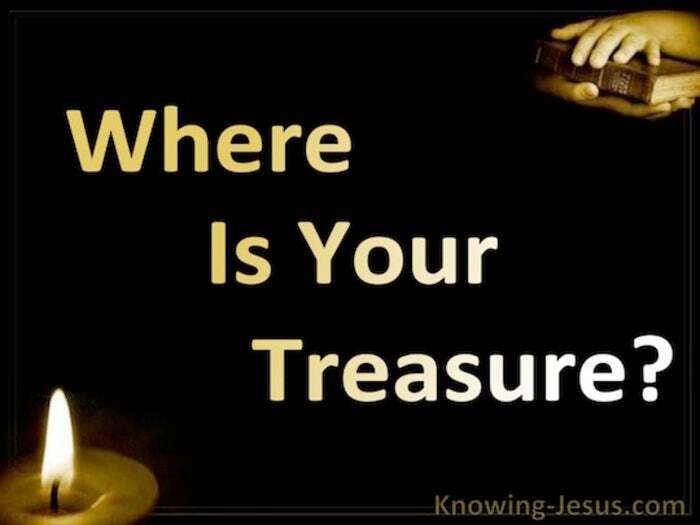 But what does it mean to store up treasure? Should we give everything away, like the rich young ruler was instructed? Should we eat husks; sleep under cardboard; retire to a cave? – I doubt i, But God does desire an undivided heart.. and He does know the evil intent of man’s mind. God knows that your possessions; your home; your bank balance can become your god. He knows that in a divided heart, (mammon and God) cannot reign together, and mammon is so much more than money – much more than dollars or pounds. Mammon is the whole realm of riches, possessions, property and commerce.. and God knows if our eye is not single – for God knows the inner heart. Treasure is not to do with whether we have much or whether we have little. It is not to do with whether we have goods or money; houses, career or position. It is whether we have become so attached to them they we prefer them to Him. It is a choice between the two – for only one can rule your heart and life. So what does it mean to make friends with mammon? Why in Luke 16, are we instructed to: “make friends for yourselves by unrighteous mammon” Luke 16:9 Does this not contradict scriptures, which warn us against the love of money? No, it does not contradict scripture, but is does have an important meaning. God has entrusted us with many things, one of which is our money – mammon. Mammon is not to be our master – but we are to master our goods and wealth. The world is shrewd in the way it conducts itself – and we must be shrewd too, but they are shrewd in an ungodly way and make mammon their god. We too must be shrewd with all we have by dealing with it a godly way. We are to act wisely with all that has been entrusted to us. God translates faithfulness into a faithful and wise servant in His service. He is watching to see if we are faithful and wise in all that He has entrusted to us… waiting to see if we fall into the category of a divided heart – waiting to see if He is all in all. It is only when a crisis arrives in our lives that our true attachments surface. It’s only when we truly recognise our position in Him that we can remain undivided. This world is not our final resting place – we are sojourners, passing through, and these little warning words against a divided heart have a deeper meaning. They are unmistakably linked to the any-day return of our Lord Jesus for His own. We are entreated in all things to have our hearts set upon Him. We are implored to, seek first the kingdom of God, and his righteousness; for if we do: all the things we need shall be added unto us. But life from start to finish is made up of many choices. We can choose the good or we can choose the evil – but we cannot have both. We cannot serve God AND mammon – the choice is God OR mammon. Do you remember Lot’s wife? – Do you remember what she did as she fled the wrath to come? She looked back – all she had built up over the years was back in Sodom, and she couldn’t bear to let it go. She compromised the grace that was afforded her – in the day of her crisis. Her actions and attitudes demonstrate the realities of a divided heart. She had not come to terms with true singleness of heart.